The Thin Executioner tells the story of overly thin, immature, and opinionated Jebel Rum, a young man on the brink of adulthood. To remedy being passed over for a chance at his father’s job as official executioner, Jebel embarks on a year-long quest to petition the god Sabbah Eid for invincibility so he can return to his home and claim the post. Although never overly graphic, the book begins deliciously with a thwack and a head plop. Jebel’s story takes place in a well-described alternate world, yet immediately recognizable to readers. He is a young man with girlfriend problems, self-esteem issues, sibling rivalry, parental neglect, and way too much attitude. In other words, a perfect character in need of an epic adventure. Accompanying Jebel on his quest is his slave, Tel Hasani, who is destined to be sacrificed to the god in exchange for Jebel’s invincibility. Their journey is filled with dangerous men, eerie places, fierce enemies, tricksters, and horrible creatures. Their path is bloody and through these events, Jebel begins to see Tel as something other than a slave – a man and a friend, perhaps? Many will liken this story to The Adventures of Huckleberry Finn, which is fitting, as the author has drawn from this masterpiece as his inspiration. Like Huck Finn’s journey down the Mississippi, Jebel Rum faces hazard after hazard, has thrill after thrill, and most are filled with blood-curdling horror that results in eye-opening revelations about Jebel’s world, and ours. For young readers, the story barrels through episode after episode, each offering a layer of maturity to Jebel until he is forced to grow up. For the more astute reader, enjoyment can be found in subtle (and some not-so-subtle) real-world parallels. This is an epic story like The Odyssey, or Jack Vance’s The Big Planet. The sense of atmosphere is often foreboding and, at each moment, the reader wonders either how did Jebel get into this mess, or how is he ever going to get out alive? Darren Shan’s international reputation is well-deserved for the epic scale of his series books, and specifically for the success of tales such as The Vampire’s Assistant. 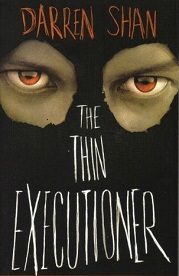 Even though The Thin Executioner is a stand-alone tale, the characters are well-developed by the end of the first few chapters. As a result, the story of Jebel Rum and Tel Hasani is thoroughly engaging and can be enjoyed by YA readers and adults alike.